This week, I’ve spent a lot of time in contemplative mode about life and death due to the myriad of articles written in regard to the suicidal passing of Robin Williams. Although I’ve never been personally touched by a close, personal experience with suicide, anytime I hear of such a tragedy, I try to figure out where I stand on the issue and what perspective I should have as a Christian mother and leader in the church. I would like to be able to say because I’m a Christian that depression has never been a part of my life. But the truth is that there have been some really low times in my life that I have walked through the “valley of the shadow of death” that is talked about in Psalm 23. As a matter of fact, I’m willing to bet that most people have, at some point, suffered with periods in their lives of sorrow, grief and despair. Life lets us down. Hormones wreak havoc on our bodies and minds. Even the strongest person can be broken down when depression rears its ugly head. Young mamas too often experience post partum depression, and we won’t even talk about the hormonal upset that takes place from “the change”. Then, sometimes it is external factors that cause great sadness within us. All of these are very real feelings. 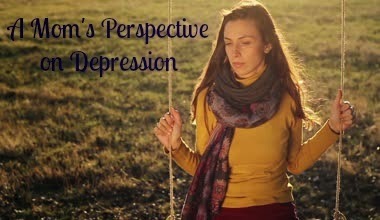 So, what does the Word of God have to say concerning depression? The most important thing to remember is that you are never alone. God is always with you. God’s Word says in Romans 8:39, “Nothing in all creation will ever be able to separate us from the love of God that is revealed in Christ Jesus Our Lord.” What a great promise! While we tend to focus on the waves that are overtaking us, Jesus wants us to focus and call on Him. We do not serve a God who is just going to sit back while we are overtaken by life’s drowning problems. God’s word says in Matthew 14:29-31, “when he looked around at the high waves, he was terrified and began to sink. “Save me, Lord!” he shouted. Instantly Jesus reached out his hand and grabbed him.” We serve a God who will reach down into any place, if we call on His name, and he will deliver us, love us and set us back on to dry land to continue our walk with Him. God’s word says in 2 Samuel 22:20, “He led me to a place of safety; he rescued me because he delights in me.” He wants us to trust Him no matter what we are going through. The Word of God is filled with promises of Hope and Joy. The Word tells us to take captive every thought and put it into submission to the Word of God. (2 Corinthians 10:5). When we are practicing this daily, Satan has no chance to put a stronghold on us or other members of our family that are affected by our depression or are experiencing their own depression. I read one article that talked about one thing that is absent in the presence of depression: Joy. As Christians, we should choose joy. And, I add to that, Hope. Without Hope and Joy, we are no different than the rest of the world that is living in darkness, trying to find their way out. It is not always easy to find hope and joy when the flesh is not seeing it, feeling it, or living it. But, we must make it a priority to cast down those things that do not align with the Word of God, take captive those thoughts, and fill our minds back up with more of the Word. Philippians 4:8 says, “Whatsoever things are true, whatsoever things are just, whatsoever things are righteous, whatsoever things lovely, whatsoever things are of good report, if there be any virtue, if there be any praise, think of these things.” With God’s help we can overcome the things that keep us from being the best wives, mothers, pastors, friends, and people that God created us to be! Beautifully put, Angie! I have never been touched directly by a suicide, but I have family members that have suffered from depression. And I think it only takes one whisper from the enemy to move that depression to the next step! We must keep the joy of the Lord in our life...no matter the circumstances! His joy will make the difference!! !